Asparagus Quiche. We tried this once, and burned it because our oven at the cafe runs 50 degrees hot, and we often forget that turning off the timer usually indicates the appropriate time to remove items from the oven; that the buzzer is not just a sound device signaling the need to be turned off. We get so carried away in what other things we are attending to in the kitchen, that oftentimes the oven timer just gets turned off, not actually checked, resulting in burnt granola, muffins, banana bread, and one fateful time, a beautiful asparagus quiche. We sort of vowed at that moment that never again would we waste such a precious amount of asparagus at the hands of laziness and non-present-ness. Baking is very zen, it takes concentration. Mindfulness, as they say. We have been waiting for the appropriate time to attempt an asparagus rematch with our oven. Tonight I was informed that the time has come. Evan is planning on spending tomorrow morning resurrecting our failed asparagus quiche. He is planning on an all butter crust. Chilled. 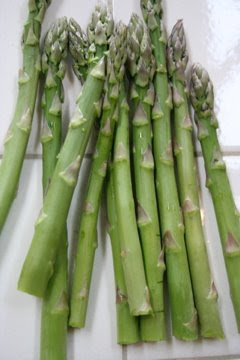 Farmers market asparagus. Eggs whipped with goat cheese. You get the picture. Will he find success? I hope so. After a somewhat bummer day in the baking department (an entire cherry pie splattered on the floor), Evan could use a boost. I for one, have very few doubts that he will be able to turn his luck around. This man whipped up some buttermilk biscuits last night and delivered them, along with some homemade jam, to our neighbors, whose dog was feeling under the weather, and whom have fed us on numerous occasions during the hardest of times. Upon returning from his delivery, he kindly shaped and baked off the leftover scraps for me, surprising me, by waking me up from my early evening nap with fresh biscuits, hot outta the oven. I swear it was the smell of pure love baking that (a)roused me from my sleep. Wow, those biscuits were... well, I'm not sure how to put this. Things are getting pretty hot over here. Let me tell you; Evan's quest for biscuit glory is nearing a climax. He is getting very good at honing his craft and he has made his wifey very proud. Together I feel our skills in the kitchen department are total compliments. I am the cook, and he is the baker. If the perfect marriage were a pot pie, which in our case that would be a perfectly apt description, Evan would be the crust, and I would be the filling. The two mingle and make goodness, if you know what I mean. Those biscuits look totally retarded good. The flakes look painted on- like when you see a beautiful sunset that looks too amazing to be real. I want to crawl into their folds and risk being eaten, just to be enveloped in buttery goodness. Leeks, Potatoes, and Onions, Oh My! "I Hope Somebody Buys This Pie."